Work on the project commenced in May of this year, with the 1st of six consecutive voyages using mv Fairpartner. The project saw Jumbo transporting a range of large and heavy equipment from China to Australia. Amongst these were a number of gantries. The gantries were stacked and transported, with as many as seven being carried in one go, utilising most of the plentiful space available on the J-class vessels. The largest piece of equipment was a 537t stacker bridge which was 126m in length. The stacker bridge needed to be lifted on to the vessel from port side, which was made possible by the J-class’ versatility and crane outreach. 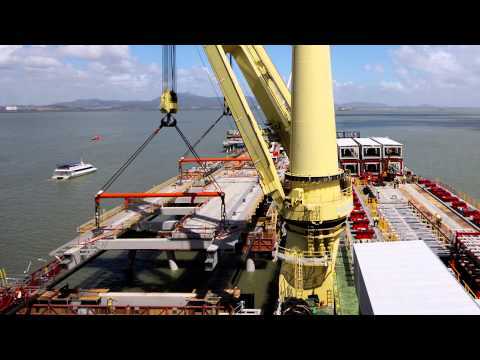 For the safe handling of this stacker a project specific lifting frame was developed which also acted as support for the stacker bridge during the ocean voyage. Jumbo’s inhouse engineering team was responsible for the design of a set of lifting beams that were versatile enough to deal with 8 modules of differing sizes and weights. The modules were transported two and three at a time to on-site location. Jumbo’s involvement with the project is set to continue next year with the transportation of the final set of wharfdecks and ultimately the transportation from Port Klang Malaysia of the shiploader weighing around 1,200t (LxWxH, 76.5x48x28.5) per may 2014 dates. Therewith Jumbo performed a key roll in the successful development of the Wiggins Island Coal Expansion Terminal Project.